Fleetwood Mac News: Fleetwood Mac - Denver: "Lindsey Buckingham’s six-string prowess is a sight to behold"
Fleetwood Mac - Denver: "Lindsey Buckingham’s six-string prowess is a sight to behold"
When you go see a Fleetwood Mac concert, you’re immediately struck by how much talent is on the stage. Stevie Nicks sings lead on classic hits like “Gypsy” and “Landslide,” but Lindsey Buckingham’s six-string prowess is a sight to behold – playing the entire concert in his signature plucking style with no guitar pick. The legendary rhythm section of Mick Fleetwood and John McVie always keeps the band rolling forward, but the story of Friday night’s "On With The Show" tour stop at Pepsi Center was the return of Christine McVie after a 17-year hiatus from the band. “A very good evening, Denver!” McVie yelled to the crowd. Stevie Nicks added, “She’s back!” and then quickly screamed “Let’s get this party started” before the Mac launched into “Dreams.” Additional musicians and three background vocalists helped supplement the sound, making their trademark vocal harmonies that much more lush. Buckingham was jumping around the stage from the opening notes and McVie quipped “That was fun!” after finishing “Say You Love Me.” The band was exceptionally tight and it was apparent they were having a good time on stage. Stevie Nicks’ signature vocals were especially strong on “Seven Wonders.” Buckingham took some extra time to introduce “Big Love” off 1987's Tango In The Night explaining the tune was originally written about “boundaries” but it has since taken on a new meaning about “the importance of change.” Lindsey performed the song by himself, showcasing his immense talent. The stage production wasn’t anything to write home about – minimal lights and random images projected onto a backdrop. 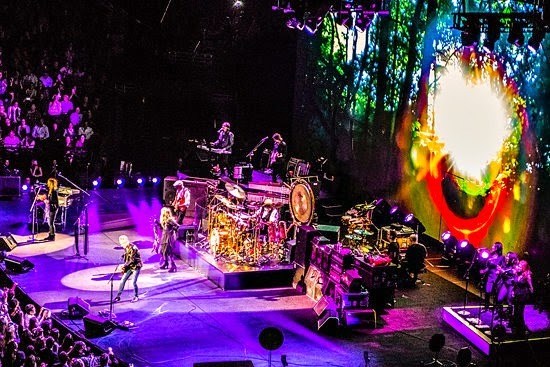 Fleetwood Mac isn’t about lasers and pyro, they were happy to let the music do the talking. And many fans were talking about the band already announcing another Pepsi Center gig. If you missed this concert, tickets for their April 1st return appearance go on sale this Monday at 10am.